We had a great week here in O’ Donovan Engineering and we even got to take a field trip which we were all very excited about, and not only because if meant we got out in the fresh air and the sunshine. 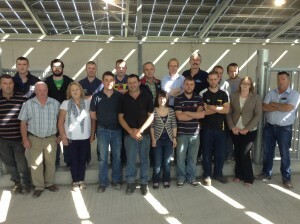 On Wednesday 28th we loaded up and headed off to the new Munster AI station in Mallow. 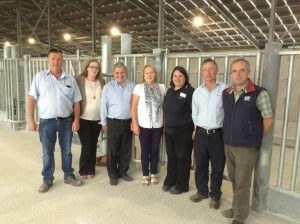 Since 2012 we have been working hard on the new bull stud, manufacturing and installing the penning, in the two sheds in the AI station in Ballyvorisheen which is just outside Mallow, Co. Cork. 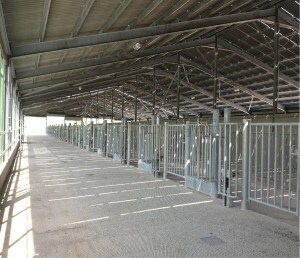 Each shed consists of 36 pens, so the facility will house 72 bulls . We were delighted to see our hard work in the flesh. We don’t often get to see our products in operation and installed on farms and so it was great to see what becomes of our products after they go off out our door and we were all very proud to see the two sheds kitted out with O’ Donovan Engineering products looking great. The two sheds are identical but were built separately, 300m apart, in case of infection or disease.The bull pens are built to allow maximum bull comfort for each bull and to ensure that they will remain productive for as long as they are required. Each pen is 14ft x 28ft with a deep bedded area in the back of each pen . The front of each pen consists of a water trough, gate for bull entry and exit, head locking gate and 13inch wide personnel slip through gate. We thoroughly enjoyed our visit to the bull station, we were proud to see the fruits of our labor and we wish all the team at Munster AI the very best of luck for the future.